1. 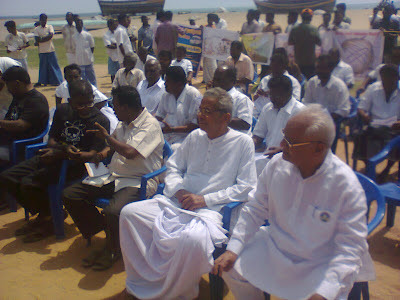 It was originally planned to have Boat Rally and Vehicle Rally with the following Demands, Close Down Koodankulam Nuclear Plant, allot 1000 MW electricity to Tamilnadu from the Central Pool, Free Distribution of CFL bulb to every family in Tamilnadu to save electricity, Traditional fisher people should have the right to fish everywhere including Marine Protection Areas as the right of art 191 of Indian Constitution for livelihood,, Lift the Ban on Sea Cucumba . 2. But SP of police of Ramanadhapuram refused to have Boat Rally since sea is not under the control of the Police but under Navy and Coast Guard. 3. The vehicle Rally was inaugurated on 2nd Feb at Rochana Nagar in the presence of Dr. S.P.Udhyakumar, Pushparayan, Justice Kosle Patil, MS. Gowrau Chinnappa, Dr. Banwarilal Sharma, Dr. Pradip Datta, Santhanam Chatterjee, Dr. Vimal Bharat. John Churchil and Thomas Kocherry. 4. The Rally was organized under the banner RFTU, and NFF. 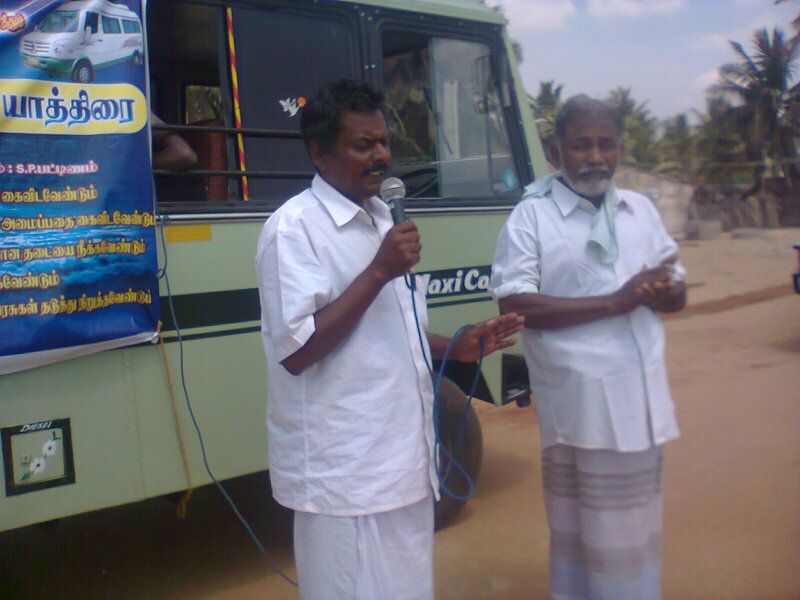 The local leaders were Palswamy, Anand. 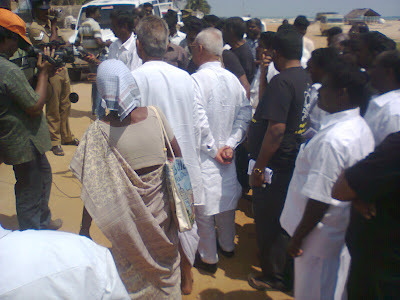 Muthaya, Jabar and others were in the Rally right through. 5. We covered 105 fishing villages. In some places meetings did not take place because fishermen were in the sea and fisher women were in the beaches waiting for their husbands coming back. But massive leaflets were distributed in all the villages. 6. There some threats from some communal quarters. So there were three police vans were accompanying the vehicle rally right through. 1. We are against the commissioning of Koodankulam Nuclear Plant, since it will affect the fish resource and fisher people. There is no technology to dispose of Nuclear waste. There are many alternatives to alternatives to Nuclear Energy. 2. We request the GOI to allot 1000 MW electricity from the Central pool to Tamilnadu to replace the Koodankulam Nuclear energy. 3. We request to give CFL bulbs to every family in Tamilnadu to save electricity. 4. We request you to allow us to fish anywhere in the sea including in Marine Protection areas as livelihood of the traditional people is more important than marine protection. 5. We request you to lift the ban on Sea Cucumber. 6. We request you to raise the compensation to 5 Lakhs Rupees as compensation to those who die in the sea. Generally the effect of nuclear plants are the following: Fifty nine out of 103 nuclear plants in the US rely on what are known as ‘once through cooling systems’ to remove waste heat. Nuclear plant authorities have always claimed that their intake and discharge of billions of liters of water a day did very little harm to the surrounding marine life. “ While millions of litres of hot water being discharged into the sea every minute, the total heat dumped into the waterway every minute, the total heat dumped into waterway is tremendous. Roger Withersperspoon, the well known US journalist, author and editor, in a recent article has given some figures. Citing company records, he points out that the nuclear power plants, at Salem, New Jersey, USA, dump about 30 billion BTUs of heat hourly into Delaware Bay. That is equivalent of the heat which would be generated by exploding a nuclear bomb, the size of the bomb which destroyed Hiroshima, in the waters of Delaware Bay every two hours, all day, every day.” Roger Witherspoon, ‘Ravishing the waterways, DEP vs the power Plants’ Dec 13, 2010., http://www.nirs.org/reactorwatch. 7. After going through this campaign we propose the following. Similar Campaign should take place in all the coastal districts in Tamilnadu. The promise of TN CM appointing a committee for public hearing should be done very fast and the members of the committee should be experts and impartial. And they should listen to the people within 10 KMS radius within Koodankulam. 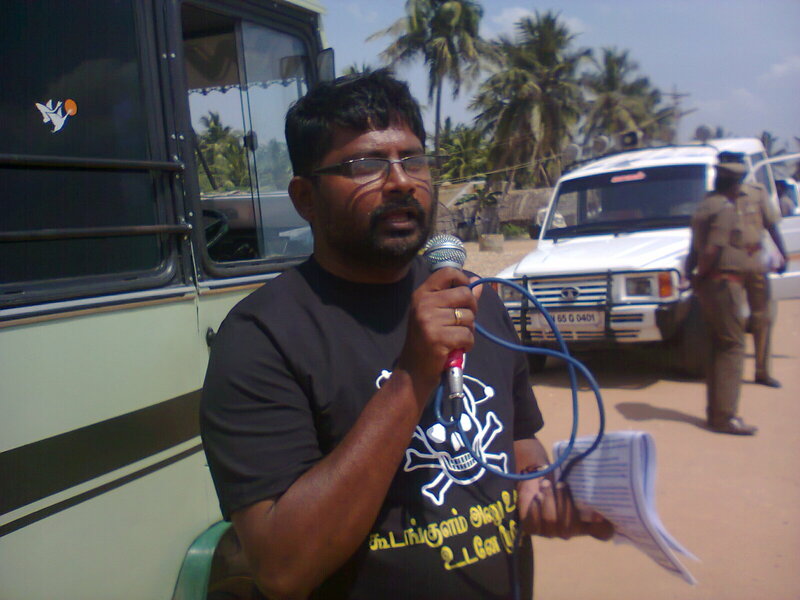 National Alliance of Peoples Movements(NAPM), India. Tel/Fax:(91)4651 237 297. Tel:(91)4651 200517 .Mobile:(91) 936 064 5772 . "The life of the Planet and the welfare of the whole humanity should not be sacrificed by the greed of a few".